Cloud computing is the biggest buzzword in business today, and for good reason too. The cloud provides many a new-found freedom to do and achieve more than ever before. Greater collaboration, unlocking work possibilities in new locations and often reducing costs provides a healthy boost for many companies. Every business is unique however, and cloud solutions don’t fit for every scenario. Connection issues, internet plans, or technical requirements can rule it out as an option in some instances. In these situations, we might install a Network Attached Storage (NAS) solution instead. Which is a very small server with lots of hard drives. A NAS is particularly popular in small, mid-sized businesses, and even home environments. Due to their low power consumption, small footprint, and low cost, they often represent an ideal upgrade. Power users and businesses can enhance their networks and get more out of their systems by employing a NAS device to do the heavy lifting. When a property can’t achieve lightning fast internet speeds or services aren’t reliable enough to run a business on; a NAS solution is ideal for the job of serving files locally rather than from a remote server can save vast amounts on uploads and downloads. Many of the benefits of the cloud can be created locally inside your home or office. Network storage allows you to save and retrieve files from multiple devices with fast local network speeds. Rather than being limited by the speeds offered by your ISP; you can complete file transfers, backups, and sharing at the speed of the hardware you purchase yourself. A NAS gives you many advantages of the cloud with the level of control, speed, and accessibility of a local server. All this is achieved for a fraction of the cost and maintenance overhead typically associated with conventional servers. NAS devices can act as a centralized backup location for active files and devices across the network. Using the device as a file store allows you to share projects easily, collaborate on files, and keep up-to-date copies while revisions change. The device can be set up to allow redundancy across multiple hard drives. This means backed up data is never vulnerable to only a single hardware failure. A fully redundant NAS is capable of handling a hard drive failure, or even removal, without interrupting your workflow. Simply replacing the affected hard drive with a new one will backup your files again and rebalance your device as if nothing had happened at all. Even retaining access to your files away from the office isn’t an ability exclusive to cloud services. 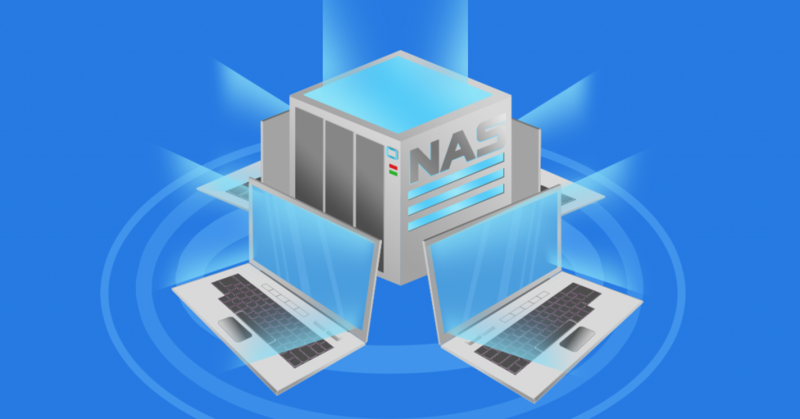 NAS devices can be configured to provide secure access to files and folders on remote connections. Working remotely, using a NAS solution, can be done just as easily as if you were sat in the office. Even when the rest of the office IT is shut-off and shut down, a NAS device can remain on and connected to the network, so access is never interrupted. A NAS device can run 24/7 without issue. Their low power consumption makes it practical to leave the device powered on for regular backups and easy data access. Devices don’t require the heavy maintenance or large footprint of a bulky server. As a simple solution, a NAS device allows you to focus only on the data. A NAS provides high-speed file access and configuration of a local server and combines it with the low footprint and ease of use of a cloud service. Without relying on a bad ISP, weak connection, or power-hungry hardware, a NAS could be the solution that supercharges your business.